Panem et circenses. Bread and games. Oh boy, nothing beats the Romans with putting out charming philosophies which worked liked a charm, until…well. Rollerball is is the sci-fi-e revival of this motto but while the Rollerball audience had its share of fun I frantically tried to find the “games” part i.e. “fun” i.e. “thrilling” i.e. “moving”. Somehow the director seems to have forgotten that. 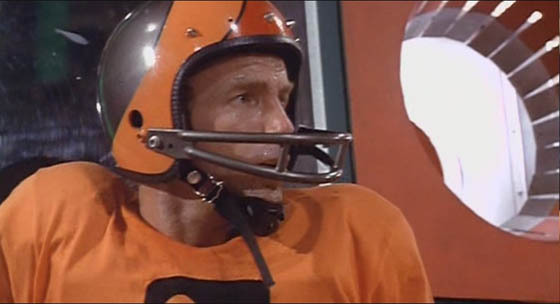 So James Caan is playing a really old guy who managed something no one else could: surviving the ultraviolent (70s violence) game “Rollerball” for decades. That’s bad. Because the designers wanted to achieve the exact opposite – which means hammering the notion into everybody that fighting gets you nothing. The corporation rules and nobody thinks. Because of that the inevitable happens: James Caan has to appear before the super-boss of them all to learn his time is up. No, the movie does not end this very minute with a shot into the head. Although I kinda wished for that afterwards. 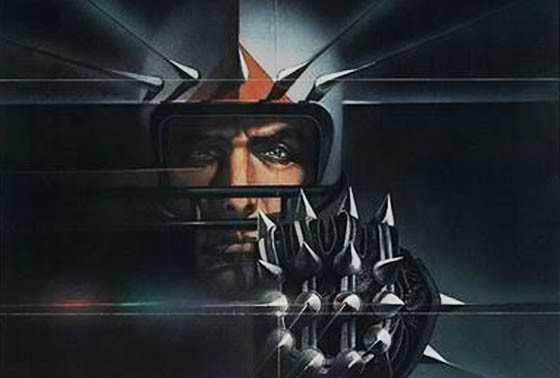 No, James Caan – in Rollerball only called Jonathan E. – has to retire…or he will die. But he won’t die by a headshot. No, if doesn’t comply he dies in the game by the game. If the last sentence resulted in some head scratching on your part, you can put your mind at rest. During the run of the whole movie I asked myself just how this should work out. You know, Jonathan was ordered to the boss because he was unbeaten and the best in the game. How the heck could you destroy him in using that? That’s logic from a far, far future. Oh yeah: the bad guys. They’re all truly, really and frankly mean in their suits. You know, sitting around, talking around and doing nothing. In other words they’re a bunch of losers. I was really wondering how those sissies could be the true evil of the world. You know being bad guy-y and stuff. I even didn’t spot one single henchman you can buy on Star Wars in the dozens. To me, sitting there and talking philosophical stuff in front of a sports man is not that scary or intimidating. Heck, even I would have beat up those nerdy guys. Rollerball gave me the impression of a movie that loves talking. People are almost constantly talking and sitting and talking. This is not bad per se but there were times when I truly wished something would finally happen. And I mean outside the game. It would have been so cool if the director would have slowly changed the focus from the game to the “real” world. You know, as in Jonathan starting to use his abilities of the game to survive his quest for truth and freedom. Something like that. But yeah, that would have cost way more than sitting people on a chair/stool/whatever. 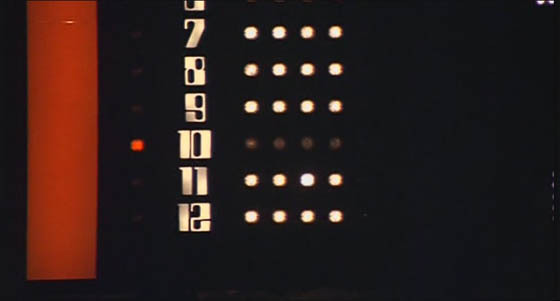 By the way: perhaps I am simply too stupid but some sequences of Rollerball felt so out of place I couldn’t help but felt sorry for it. This applies especially to this awkward moment when Jonathan visits the so-called “super computer” to answer his questions. Well, at the end, the main character was as helpless as before and I was slamming my head onto the table. 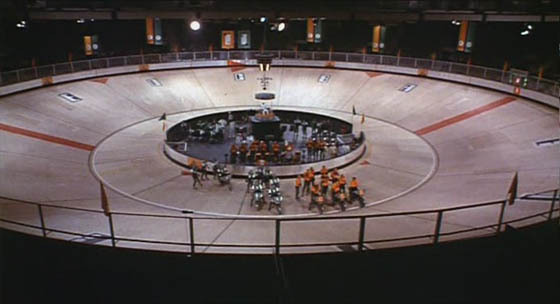 I bet with anyone of you that when you cut out this sequence it would make no difference to Rollerball whatsoever. Of course you could go artsy and tell the world that this was the exact meaning of it. But I don’t buy it. The same goes for those cut-aways to a drunk but trigger-happy group of morons during another dispute between Jonathan and the master of society. In a way you could call Rollerball a great example of the good old 70s: slow, artsy, stoned. I bet a Japanese director would fly through the same plot in a mere twenty minutes. Nevertheless Rollerball was not a total disaster to me. In fact this movie has quite its charms when you can look beyond its problems. 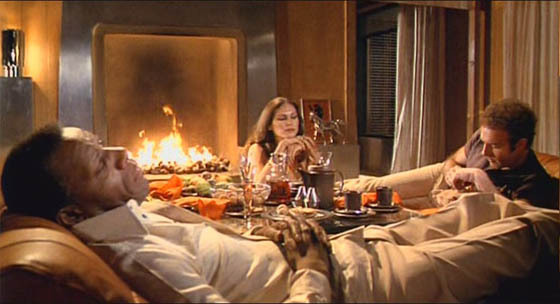 Its main charm is of course the fact that Rollerball is soooo 70s. in this case I don’t mean the plot but the visual stuff. 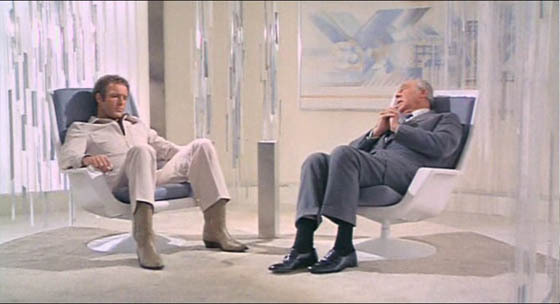 The colors, the fonts, the technology, the smallness of the sets. Everything. Rollerball is no sci-fi movie, no, it is a wonderful historic flick at its best. Those computers alone…they look so analogue and big that I could cry each time I see them. I am quite sure my Mp3-player has more computing power than those things from the “future”. Wonderful! It’s those moments that save this movie for me somehow and let me smile, despite inversing my smile minutes later. Many in the nets tell you that Rollerball is the second best thing since sliced bread or Star Wars. Well, I am someone who doesn’t. This movie has its good moments and respectable action scenes for its time. On the other hand nothing got really solved or answered, we got no deeper glimpse into society or less talking heads. If you are a movie lover like me you can give Rollerball a try. Everyone else should grab their skates and do some sports. Slow and futuristic. Some call it art, I call it boring.